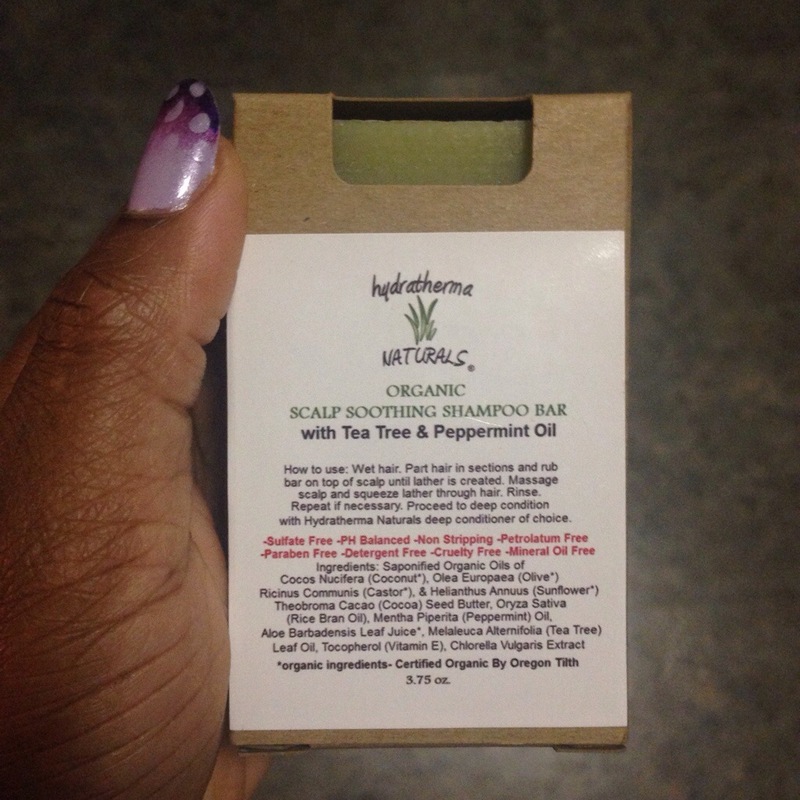 Yesterday I had the pleasure of trying Hydratherma Naturals Organic Scalp Soothing Shampoo Bar. I love that it’s made with organic ingredients and lots of saponified oils. It’s not generally something I look for in hair products, but I absolutely love when I stumble upon a good one. I completely saturated my hair with water and rubbed the bar on areas of my scalp a bit. A little rub creates a lot of lather. It’s very aromatic with the smell of peppermint. It was actually the first thing I smelled when I opened the box it was shipped in. The peppermint also gives a slight tingly feeling to the scalp, but not overpowering to the point of burning. The shampoo rinsed clean. I lathered twice because my hair was really greasy to start. My hair didn’t feel dry or stripped, but cleaner than if I used a sulfate free shampoo. I like lather in my shampoo. My hair and scalp felt refreshed. Truth be told, I’m a sucker for shampoo bars. My only thing with them is that they don’t come with something to store them in. What am I supposed to do with it until the next washday? My first impression is that I like it. I can easily see that it’ll last a very long time. It’s definitely worth a try. « Natural Hair Blog Directory! I suppose. I actually have one. I guess I only think of those when I think of bath soap. The last shampoo bar I had was also circular shaped and HUGE so it wouldn’t fit. The Hydratherma Naturals one will fit perfectly. You can get a soap holder at the dollar store or walmart.